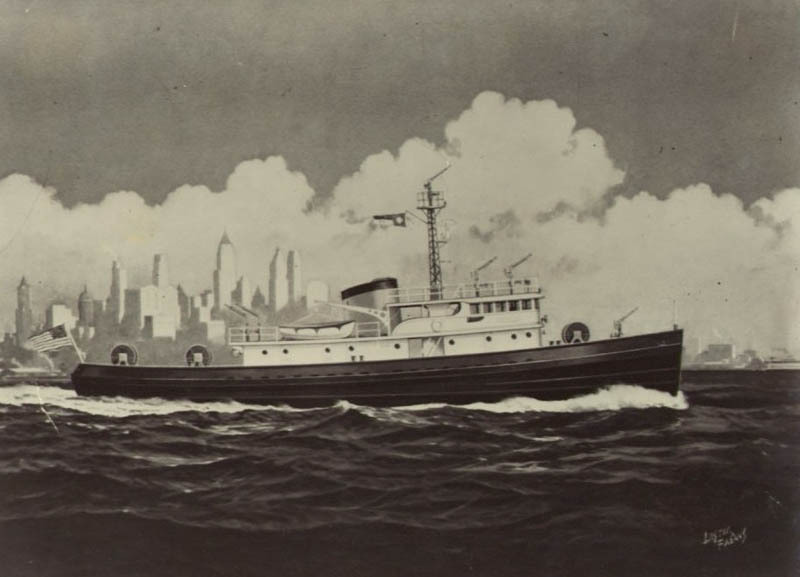 1958 - Fire Boat "H. Sylvia A. H. G. Wilks"
Artist concept of the FDNY Fireboat "John D. 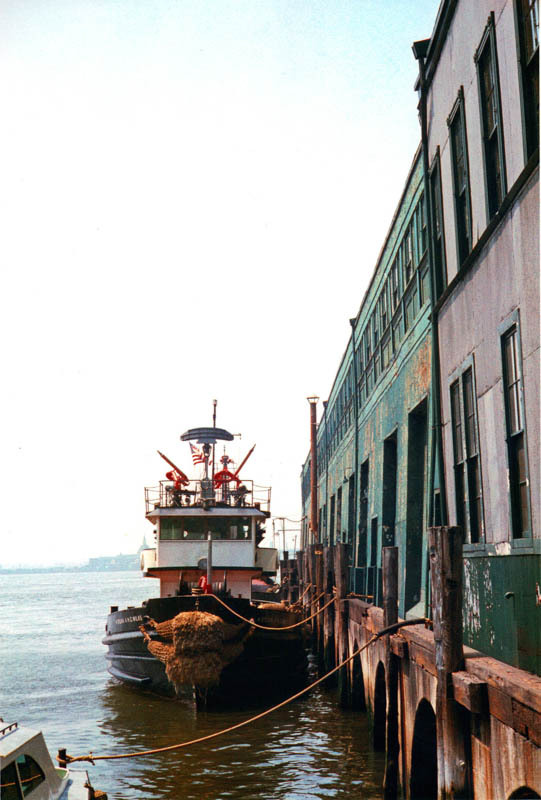 McKean." 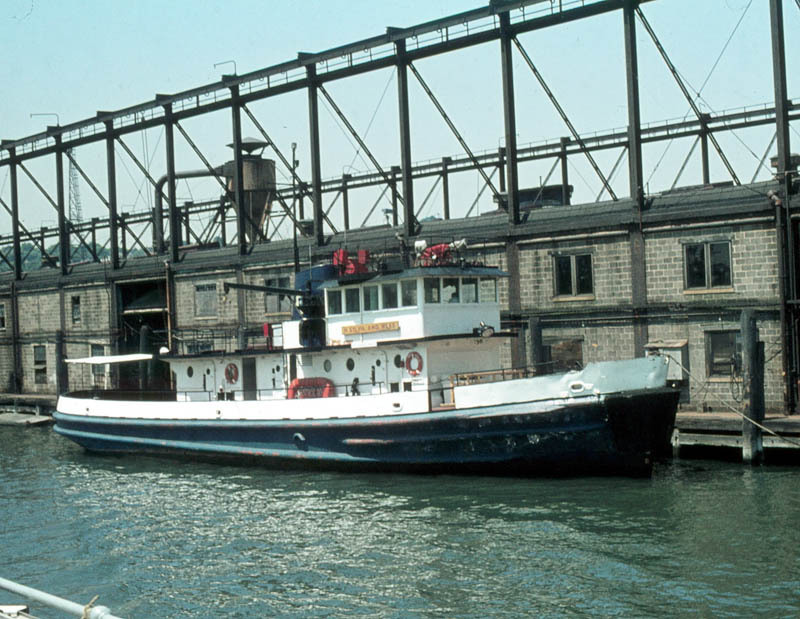 Equipped with 6 monitors and a water tower mast. 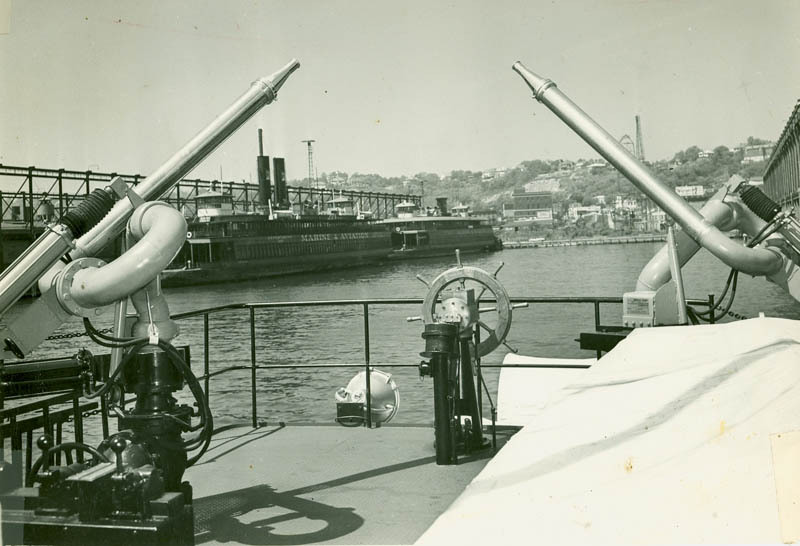 of the McClellan who was killed in 1953. 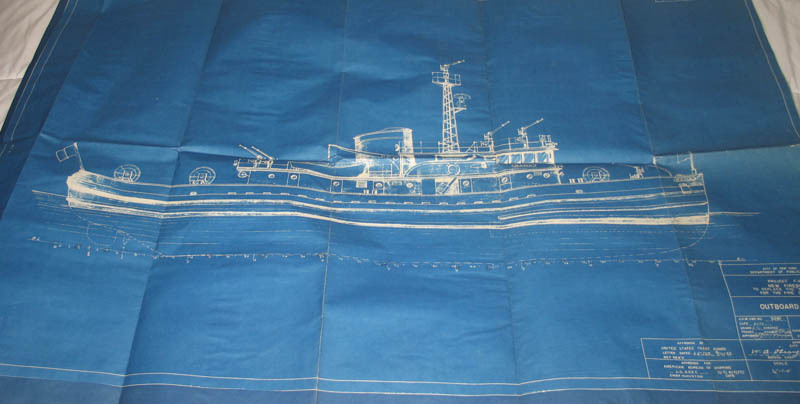 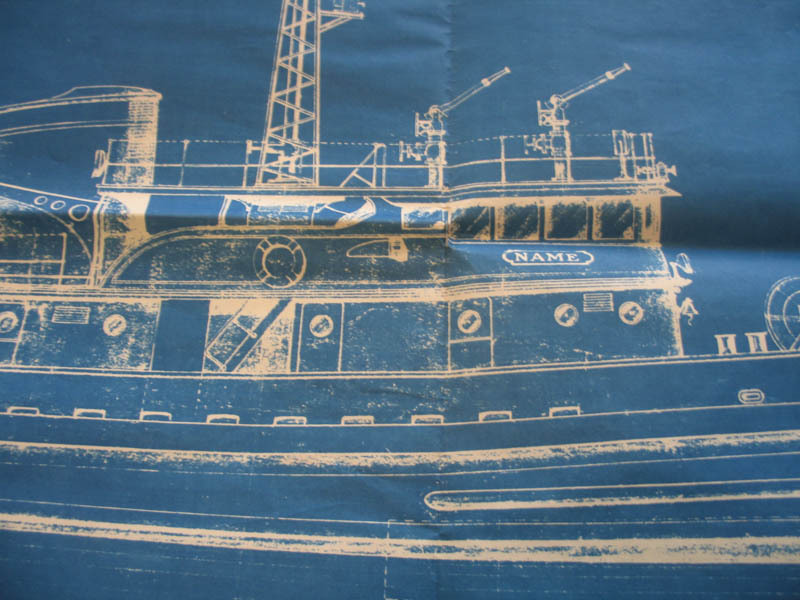 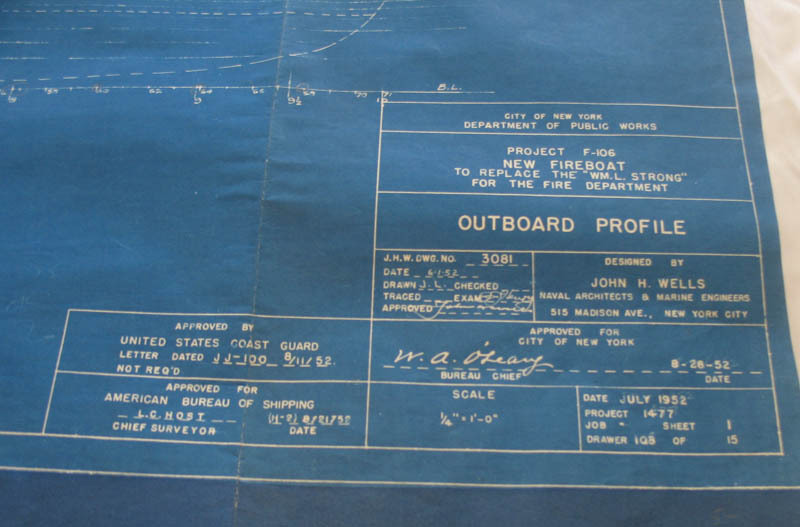 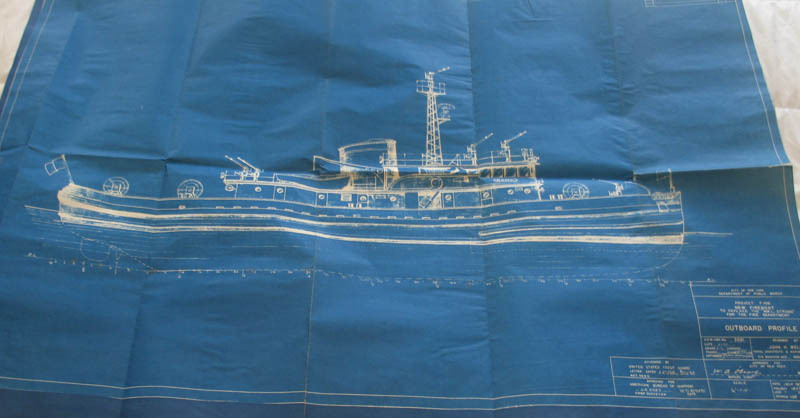 Original blue prints of the fireboat to be built to replace the Wm L Strong. 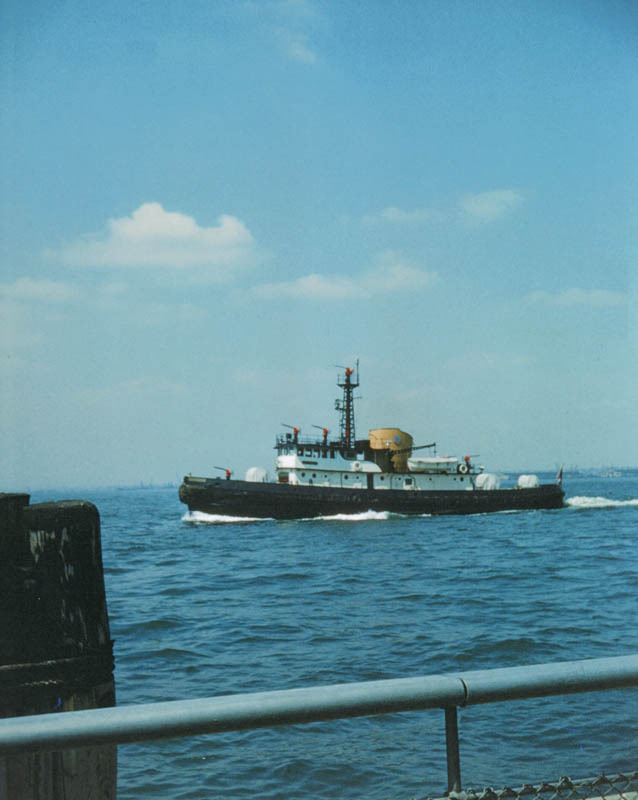 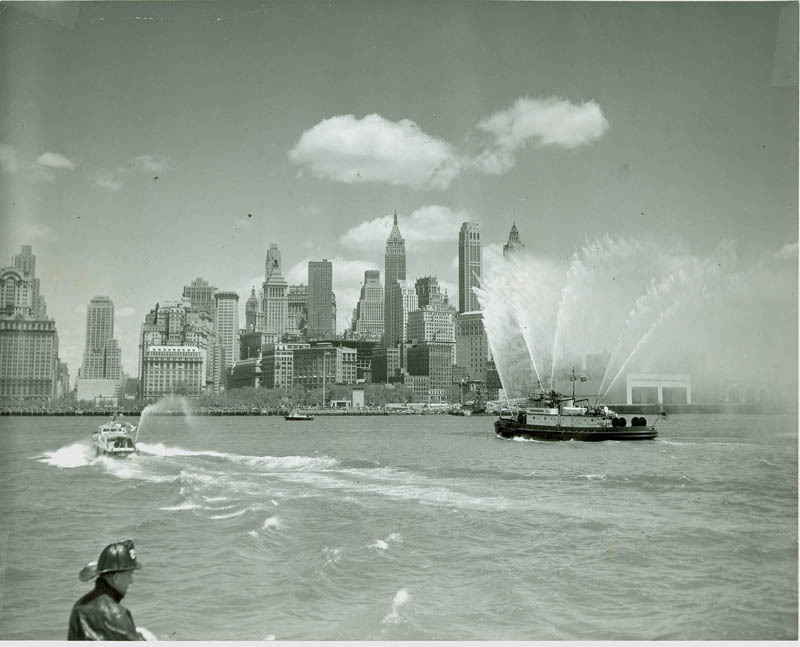 This boat would become the "John D McKean"
on maiden arrival by the Statue of Liberty and the "Fire Fighter"
by the 'Thomas Willett" and the "Fire Fighter"
Firefighter teamwork aboard the FDNY Fireboat "John D. McKean"
Stern view of the FDNY Fireboat "John D. 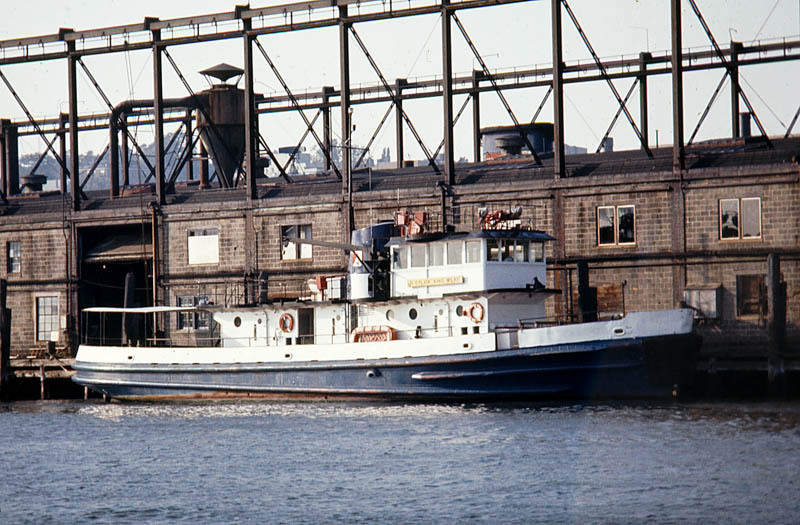 McKean." 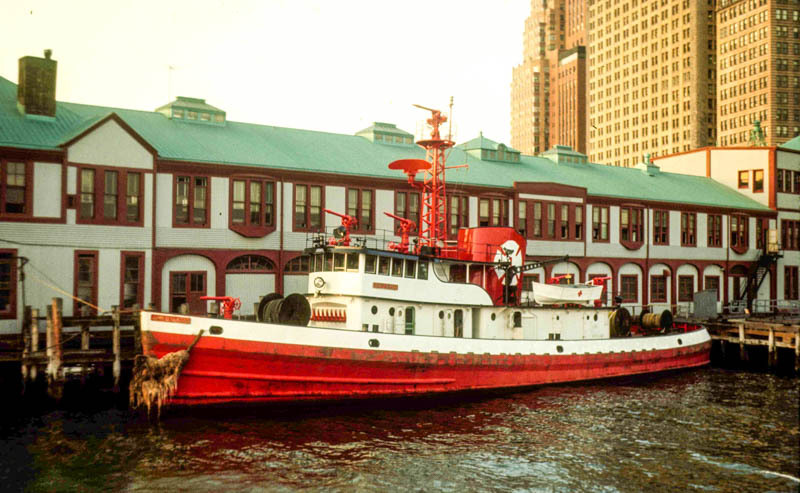 FDNY Fireboat "John D. McKean" at Pier A Manhattan. 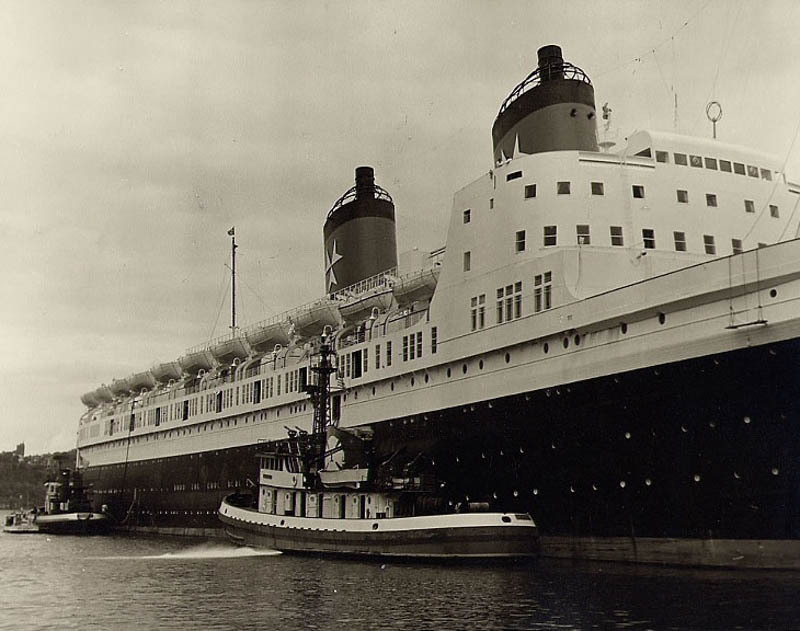 "John J Harvey" and the "John D. McKean" alongside the liner "Hanseatic." 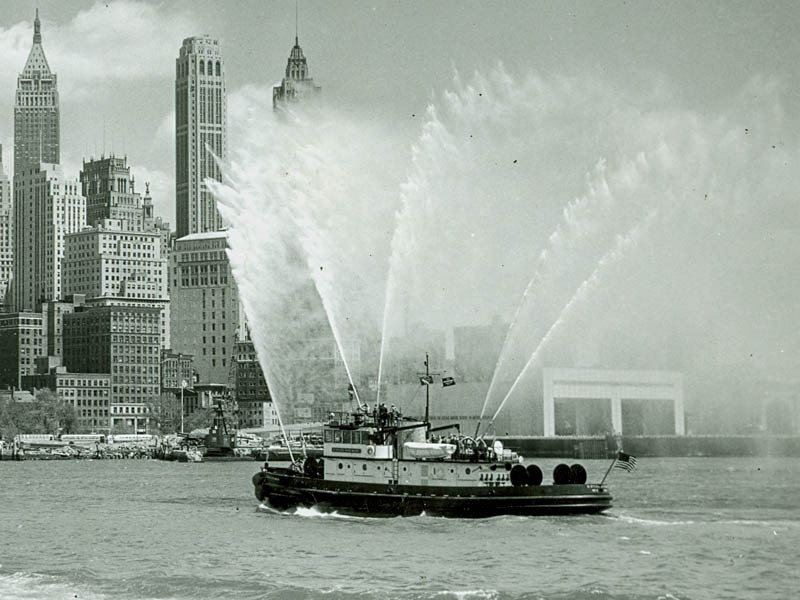 FDNY Fireboat "John D. McKean" in action. 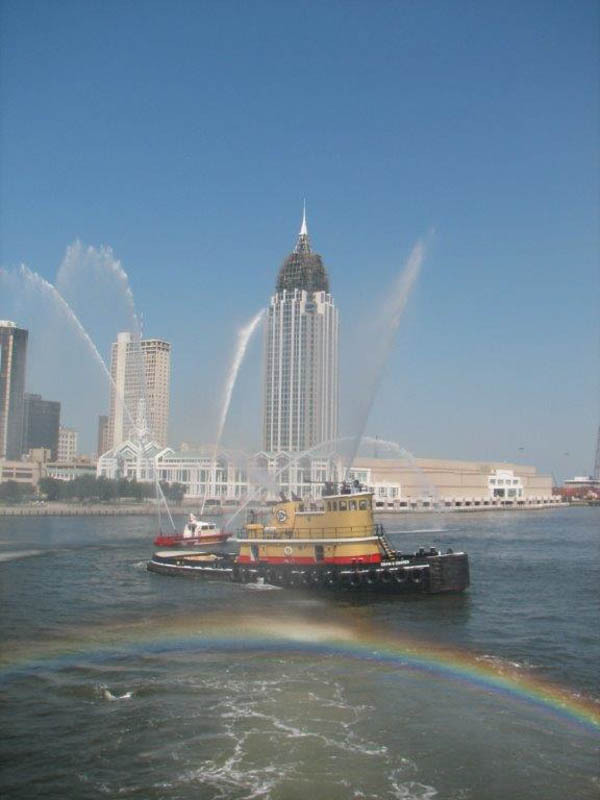 Red, white, and blue colorful display by FDNY Fireboat "John D. 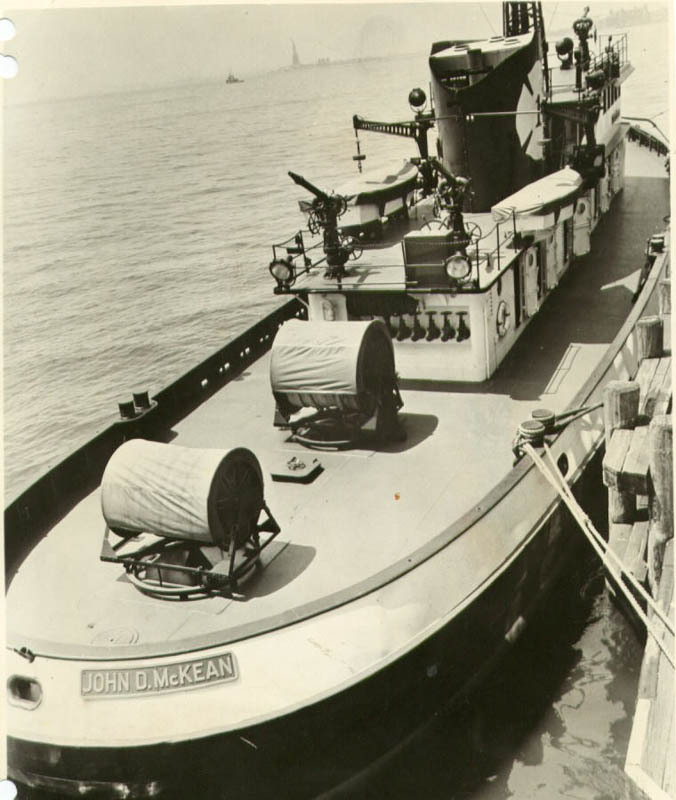 McKean." 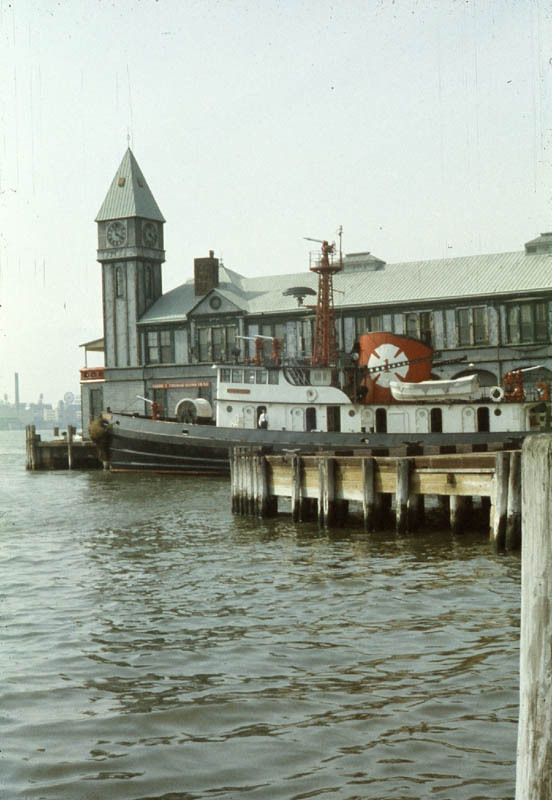 FDNY Fireboat "John D. McKean" ready at Pier A.
FDNY Marine 1 "John D. McKean" at Pier A.
Fireboat "John D. McKean" approaches quarters. 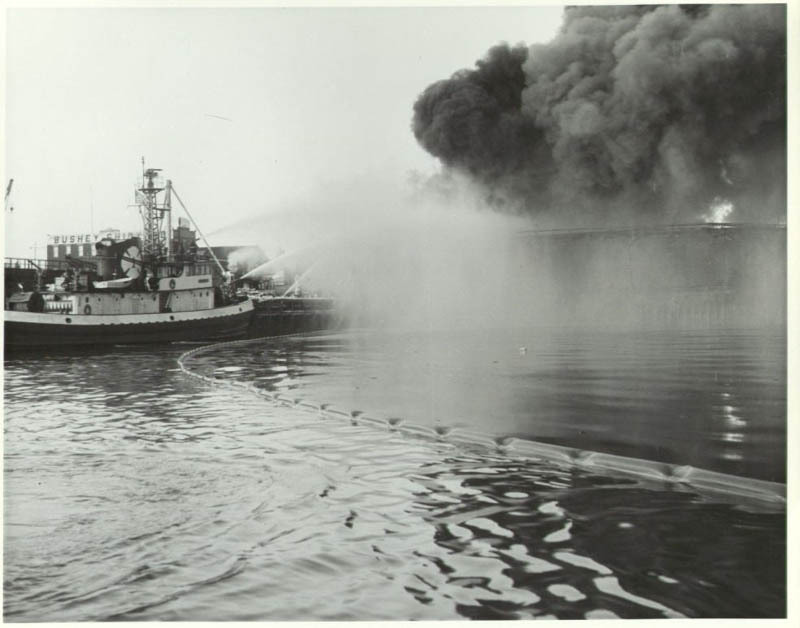 Fireboat "John D. McKean" operating at a pier fire in the North River. 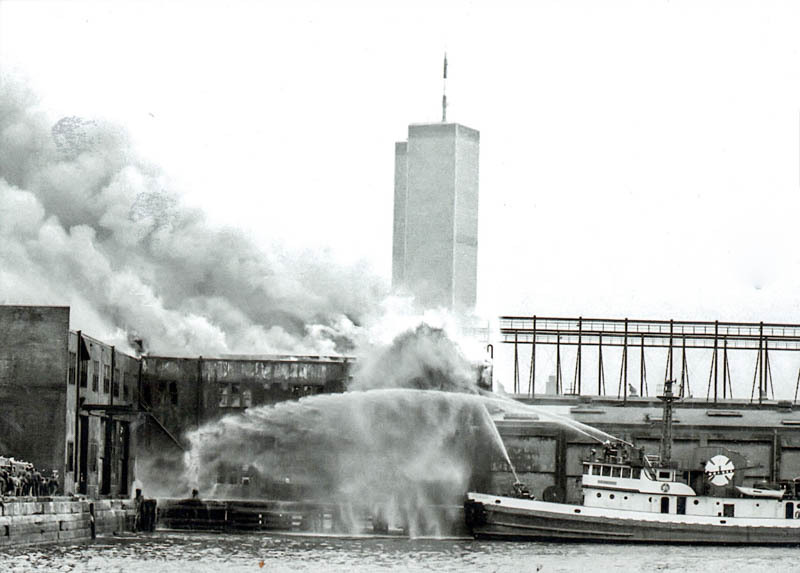 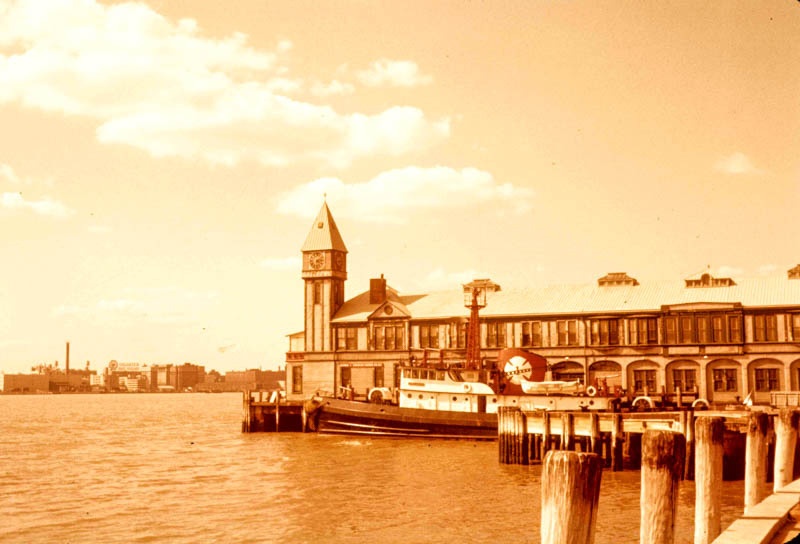 Fireboat "John D. McKean" Marine 1 operates at a Brooklyn pier fire. 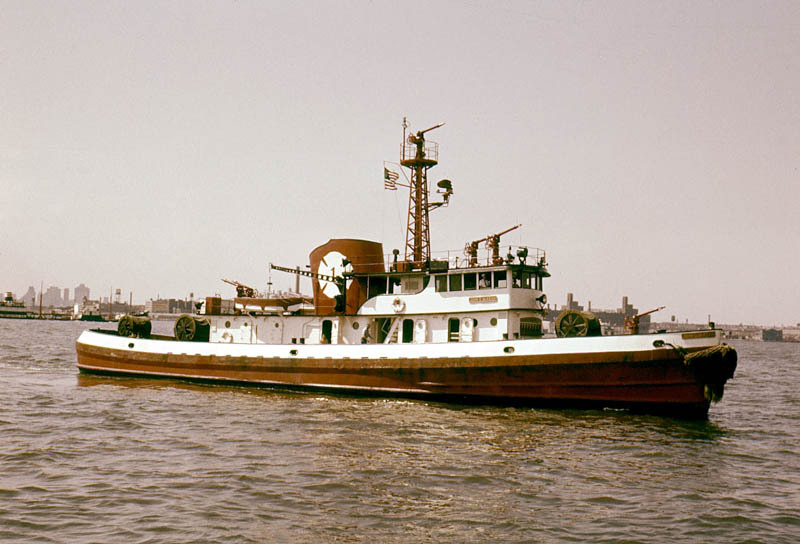 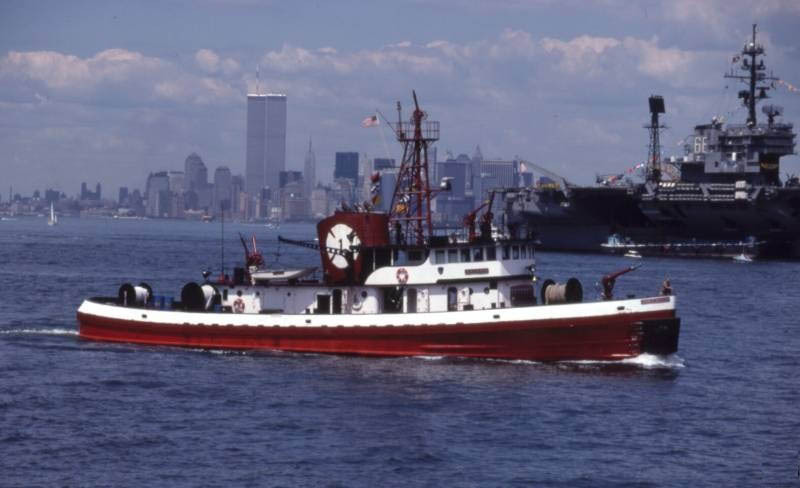 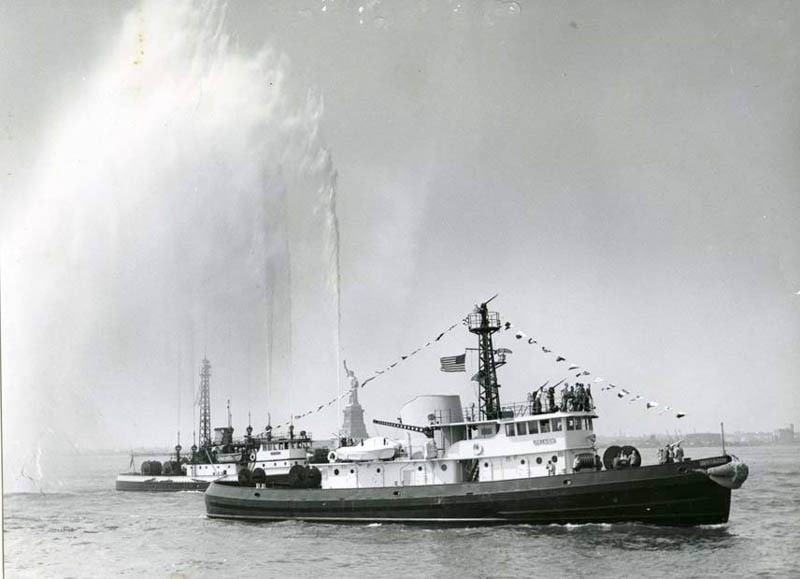 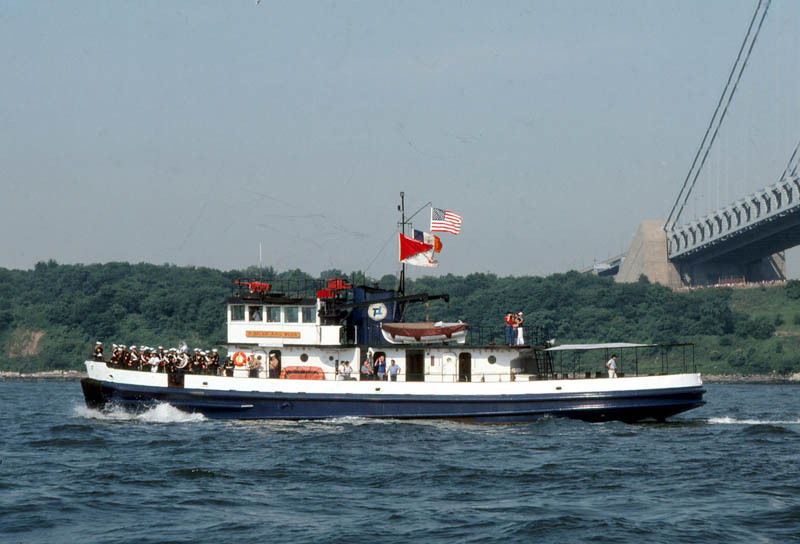 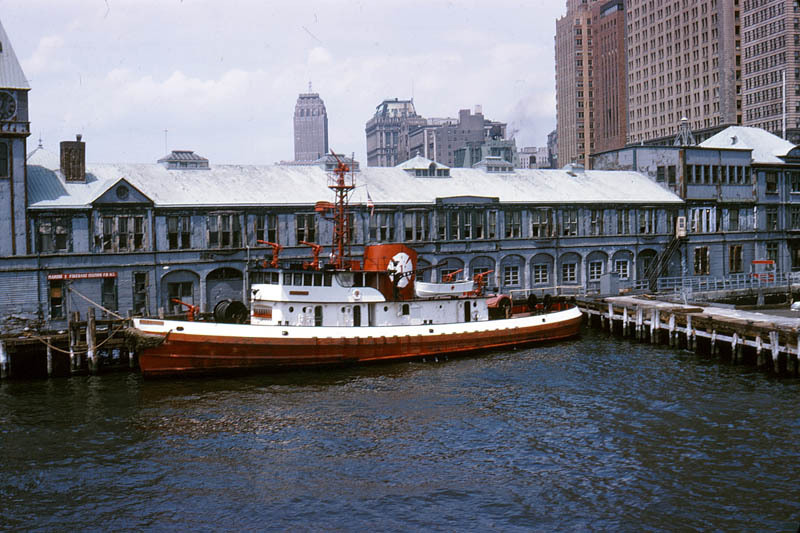 Fireboat "John D. McKean" during Fleet Week in 1979. 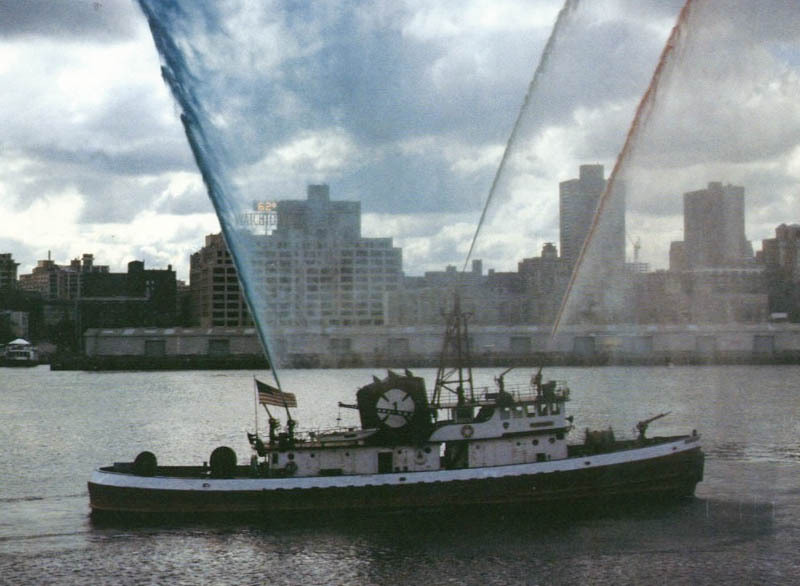 FDNY Fireboat "John D. McKean" Marine 1 last days in service. 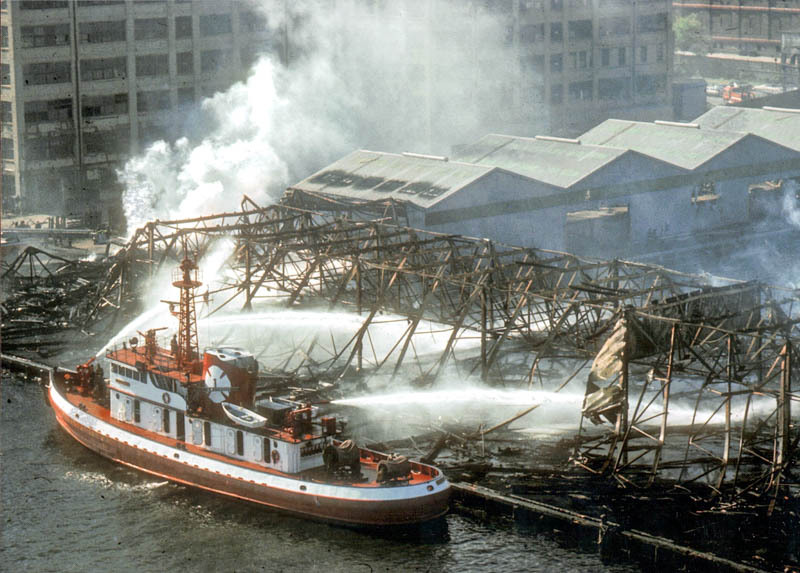 that benefited firemen and their families. 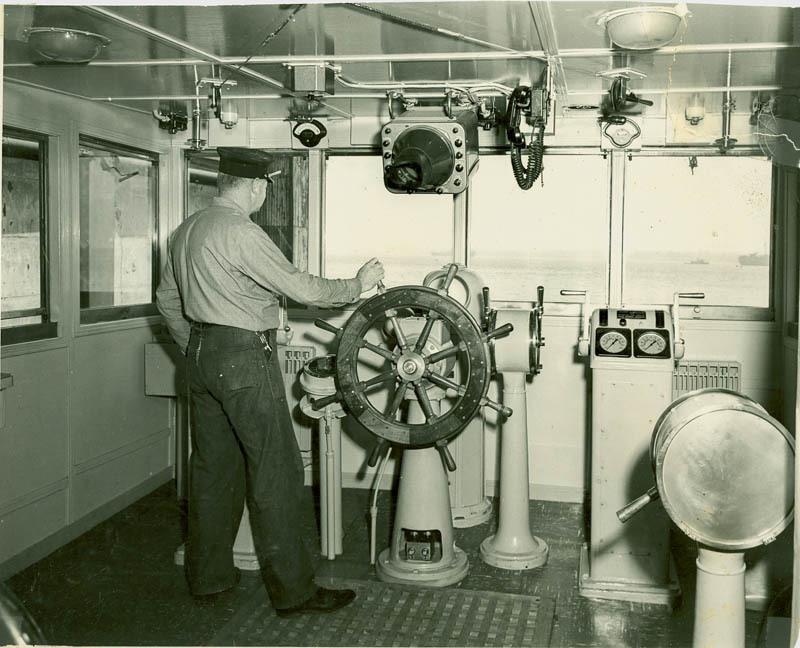 Pilothouse of the Fireboat "H. Sylvia A. H. G. 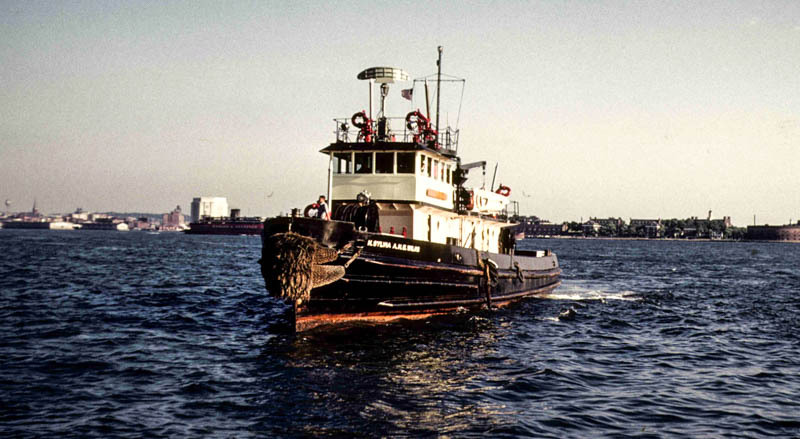 Wilks." 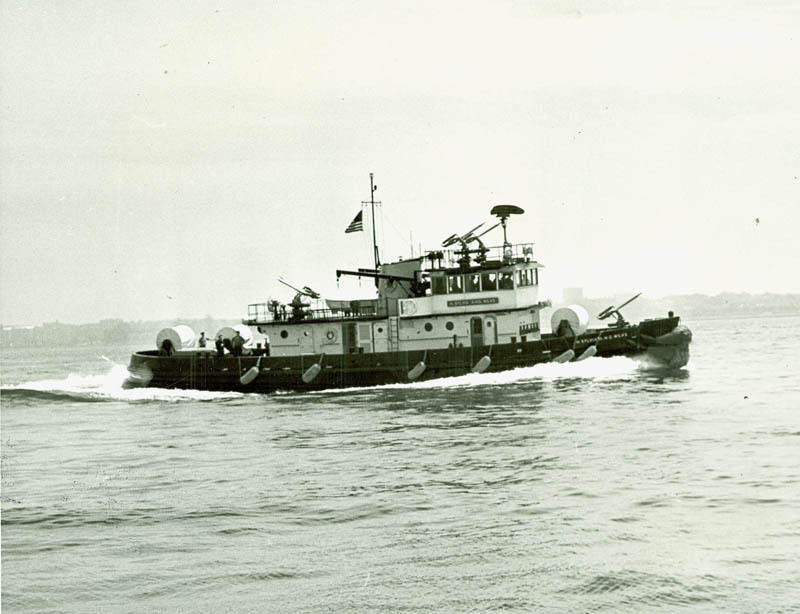 Fireboat "H. Sylvia A. H. G. Wilks" pilothouse deckguns. 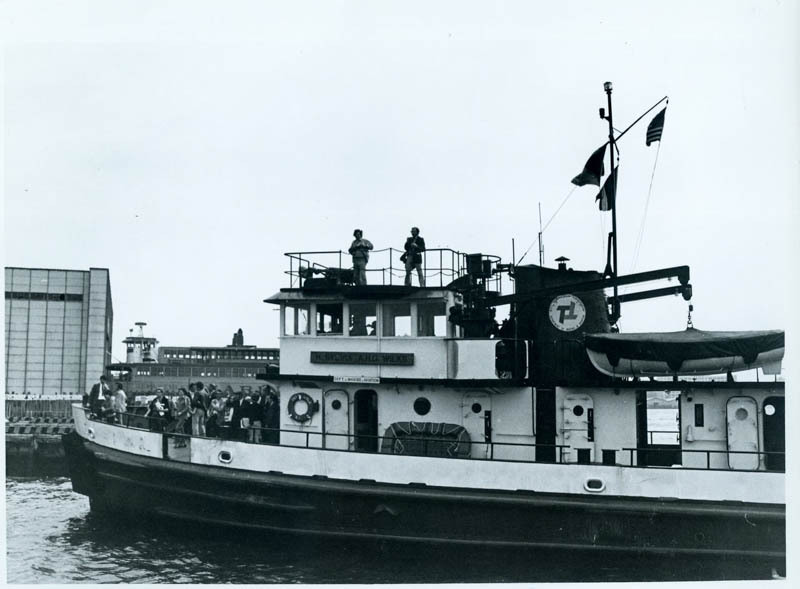 Deckgun in operation Fireboat "H. Sylvia A. H. G. Wilks"
Arrival of the Fireboat "H. Sylvia A. H. G. 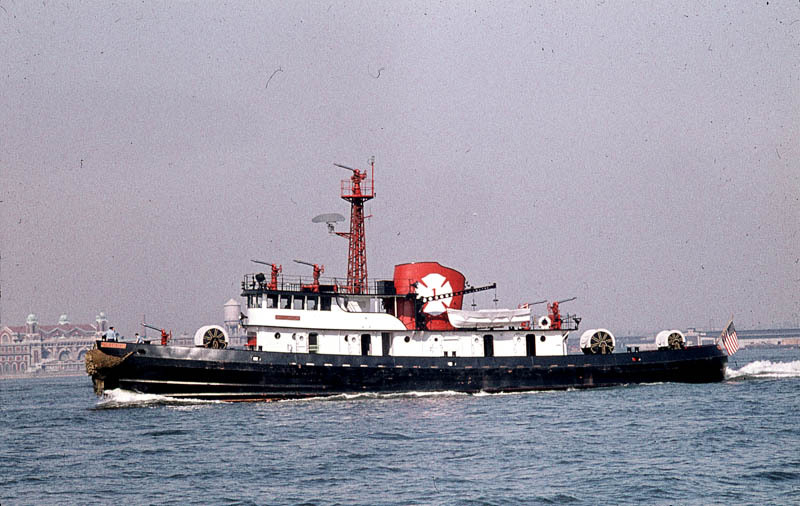 Wilks." 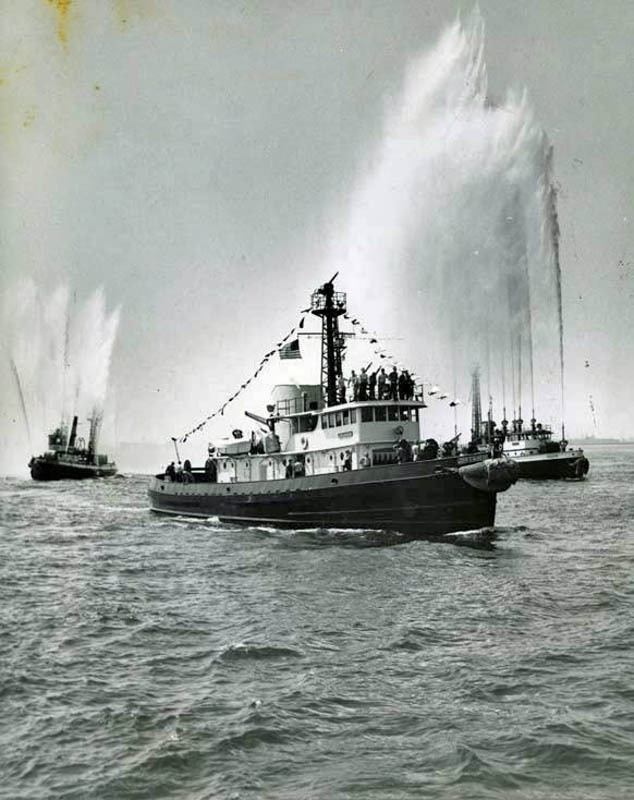 Arrival of the Fireboat "H. Sylvia A. H. G. Wilks" closeup. 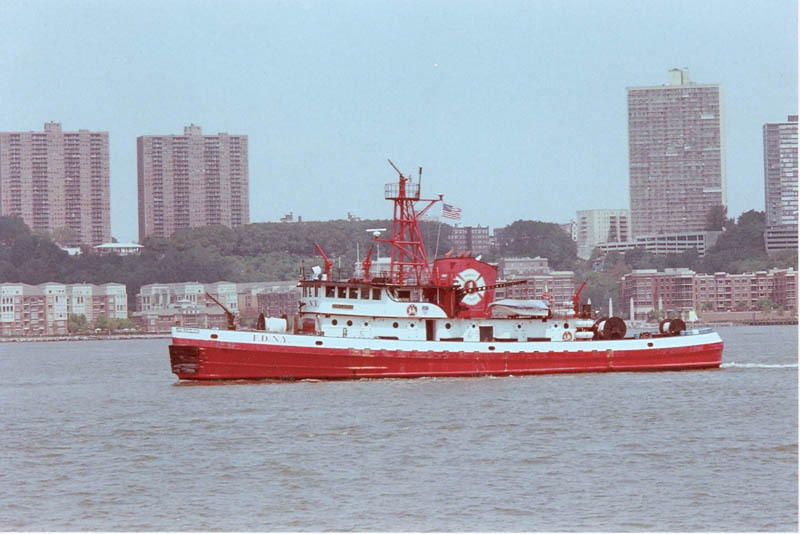 The Fireboat "H. Sylvia A. H. G. Wilks" approaching Manhattan closeup. 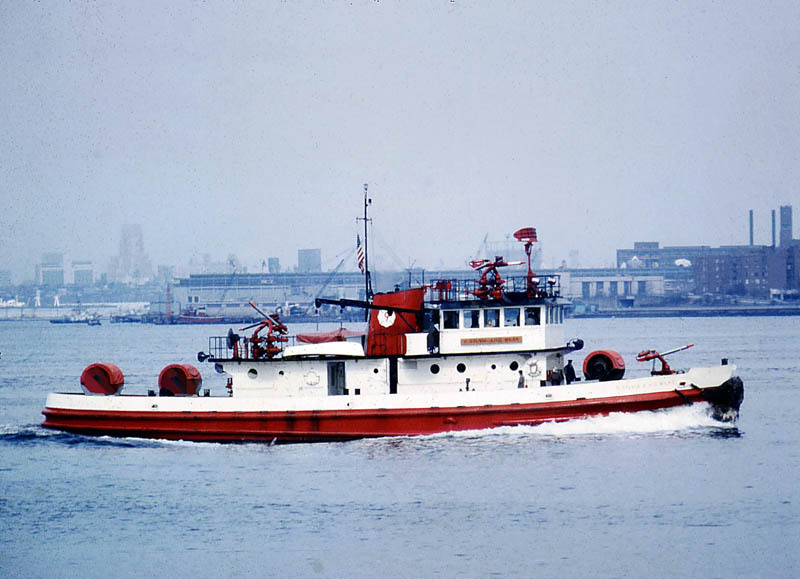 Fireboat "H. Sylvia A. H. G. Wilks" Marine Co.7. 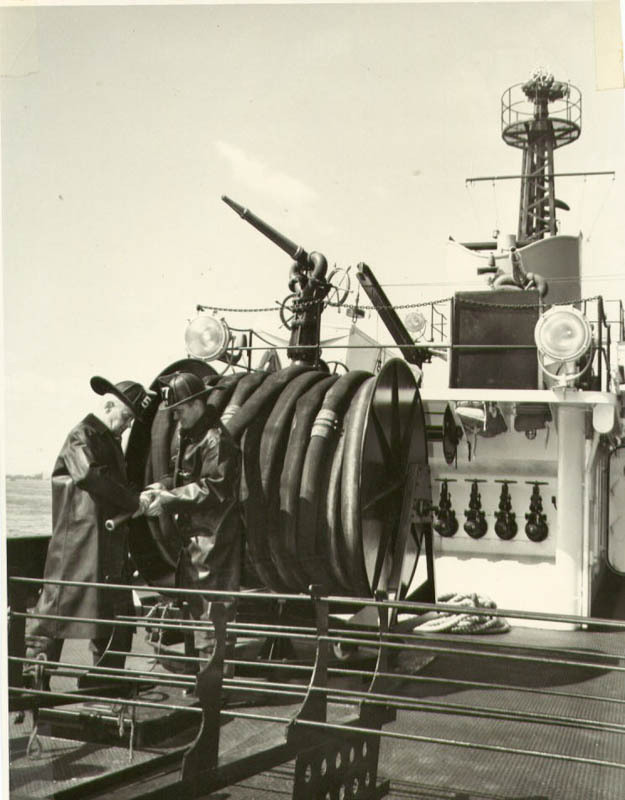 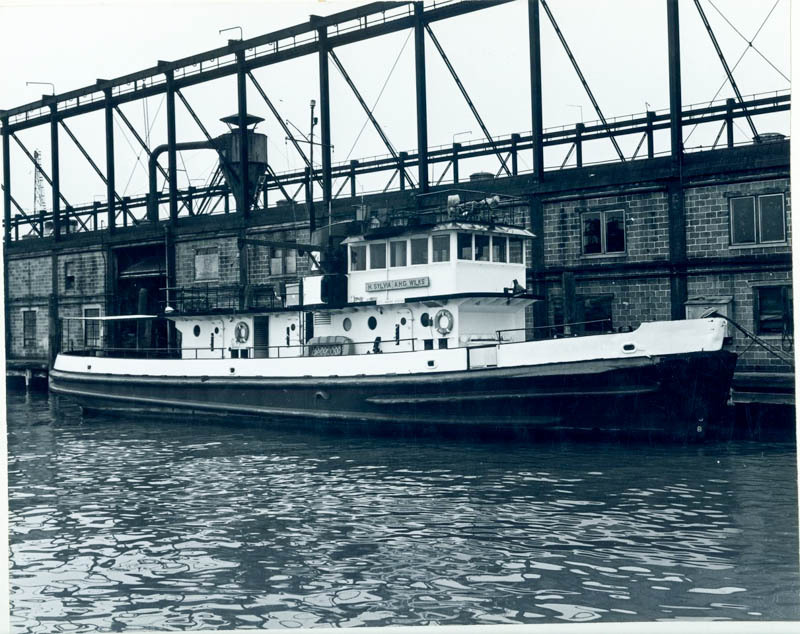 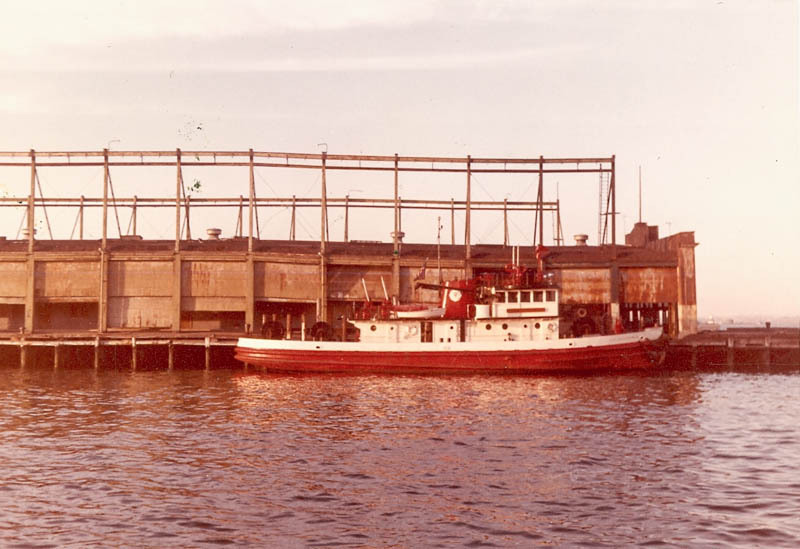 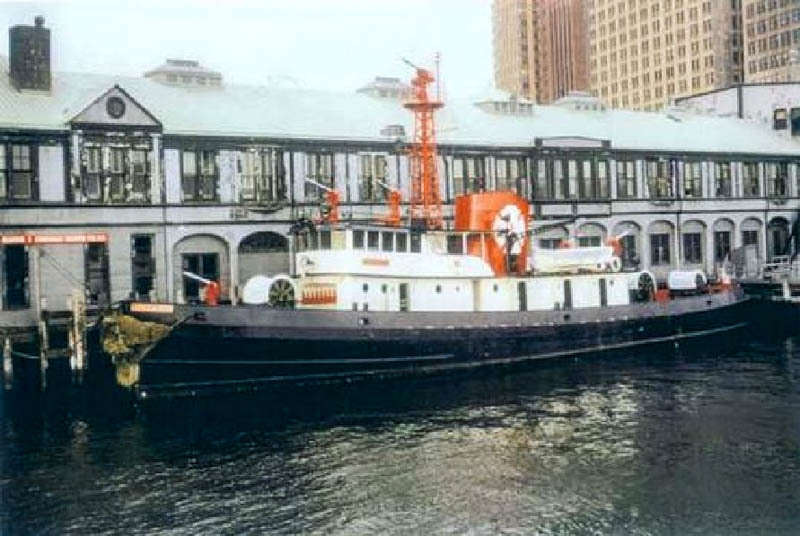 Only known photo of the Fireboat "H. Sylvia A. H. G. Wilks" as Marine Co. 9.
the "Firefighter" Marine 9 was temporarily assigned to Marine 1 at Pier A. 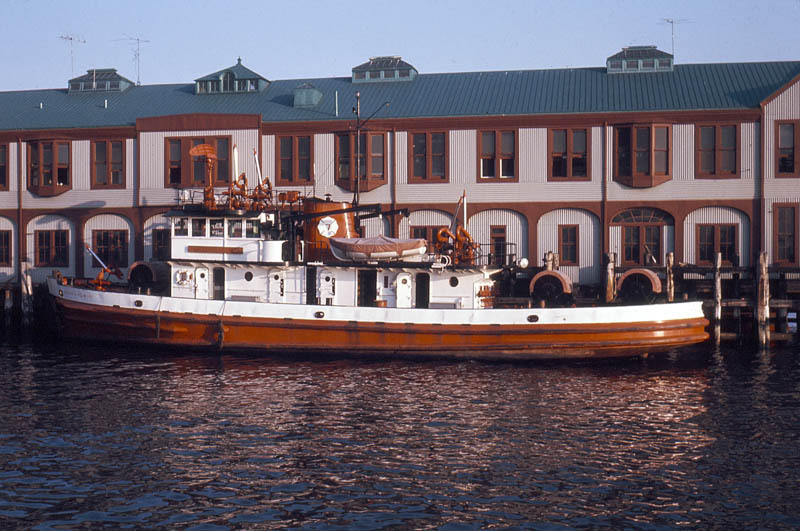 The "Wilks" Marine 7 was relocated to Marine 9 until the "McKean"
came back in service and the "Firefighter" returned to Marine 9. 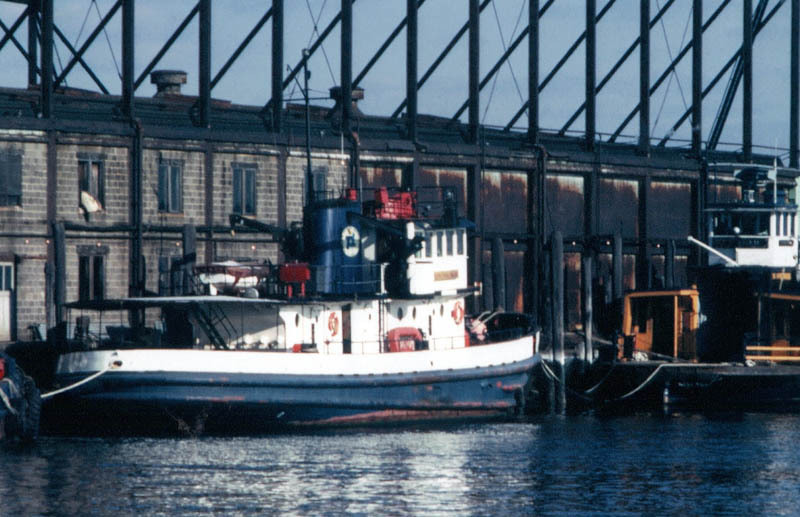 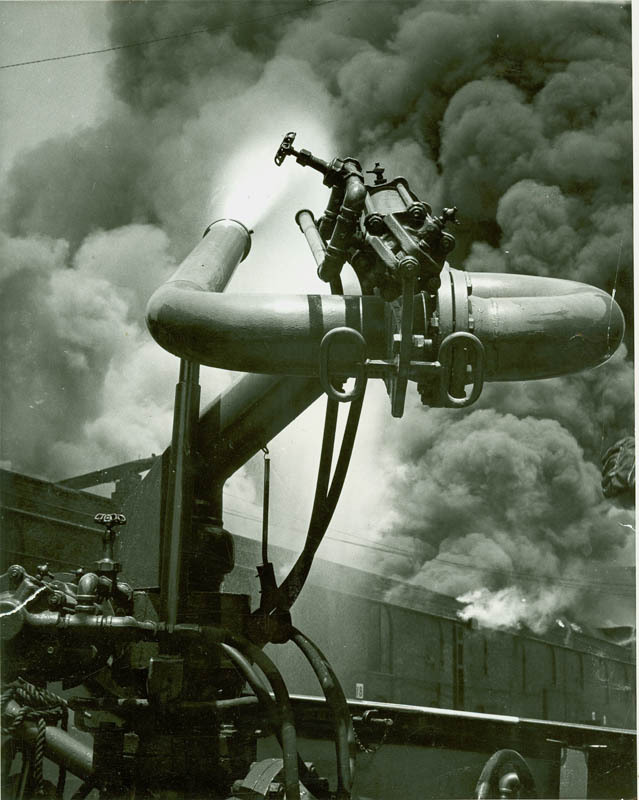 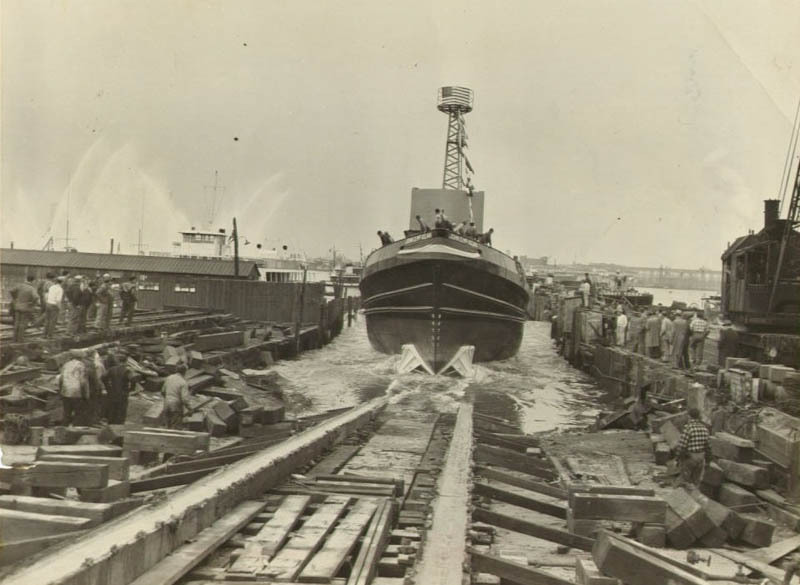 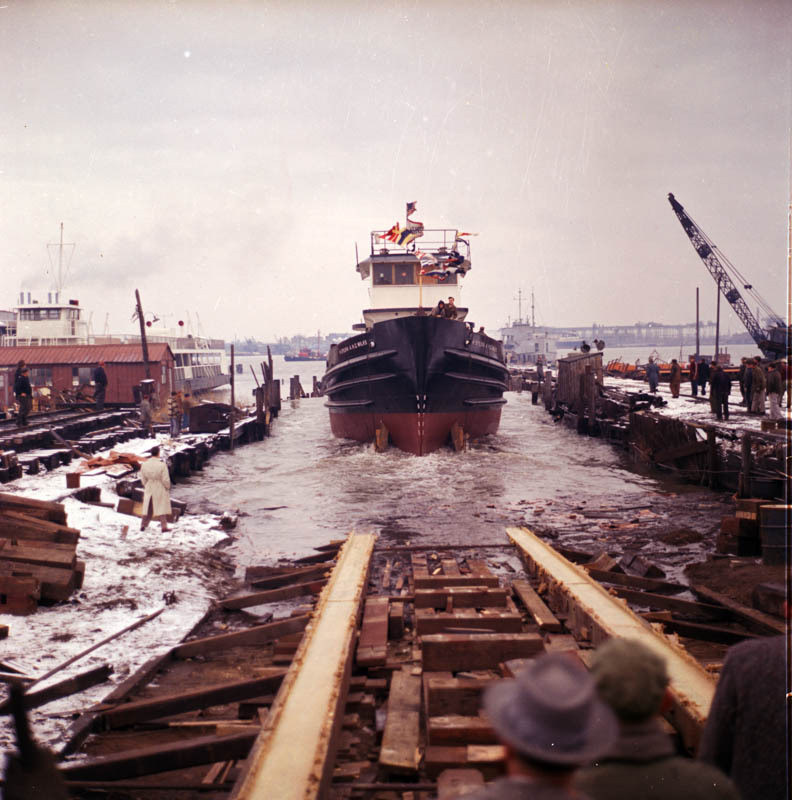 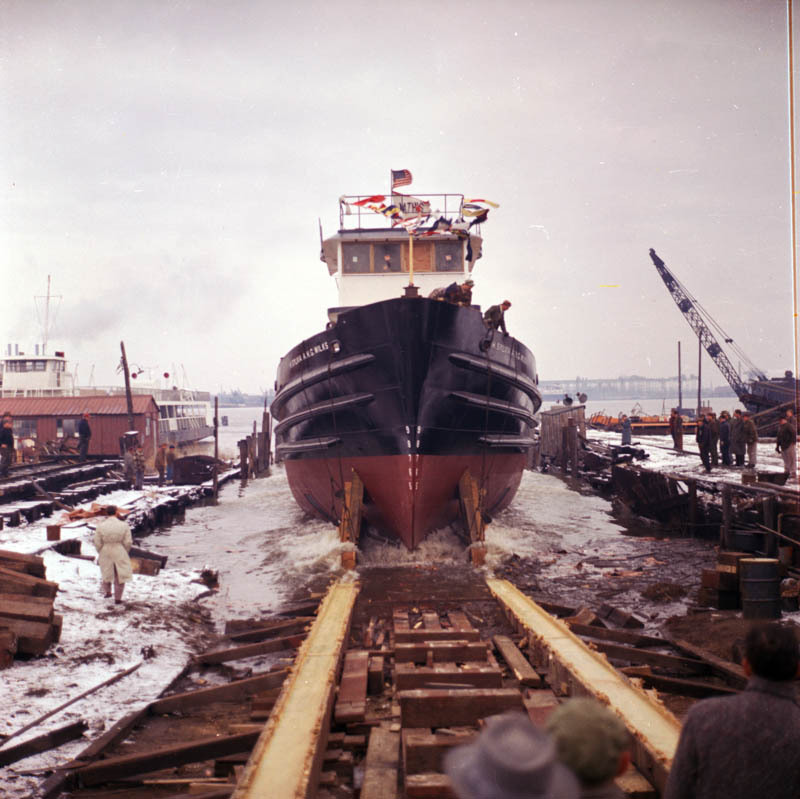 This may be one of the few known photos showing the "Wilks"
fire service ultimately becoming a tug boat. 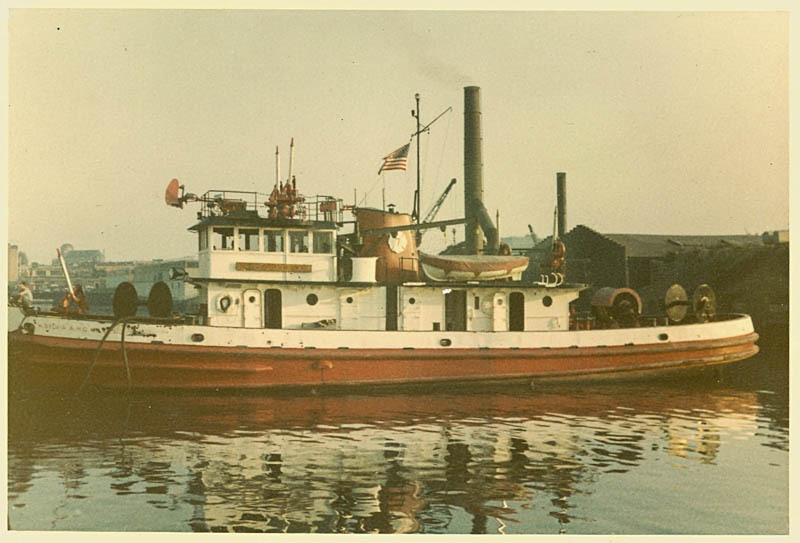 Only known photo of the Fireboat "H. Sylvia A. H. G. Wilks" as Marine Co. 9 closeup. 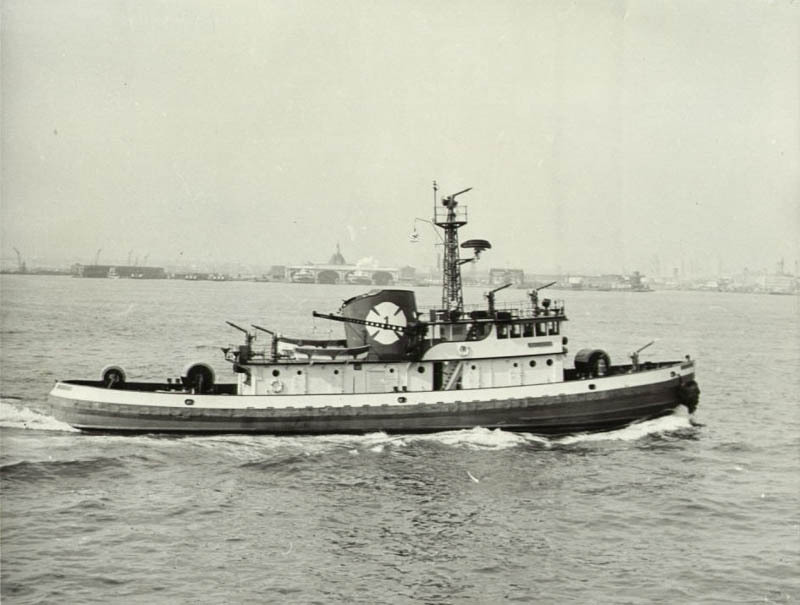 Underway photo of the Fireboat "H. Sylvia A. H. G. Wilks" as Marine Co. 9. 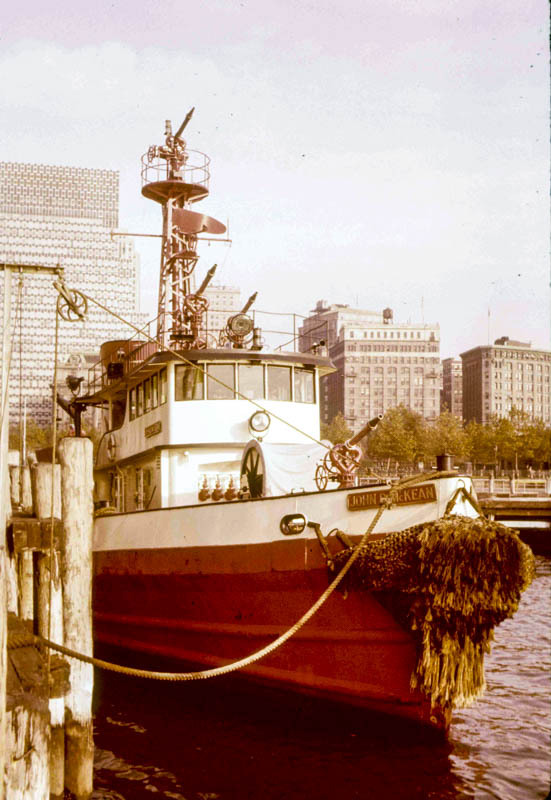 Decommissioned Fireboat "H. Sylvia A. H. G. Wilks"
Boat was previously Marine 7. 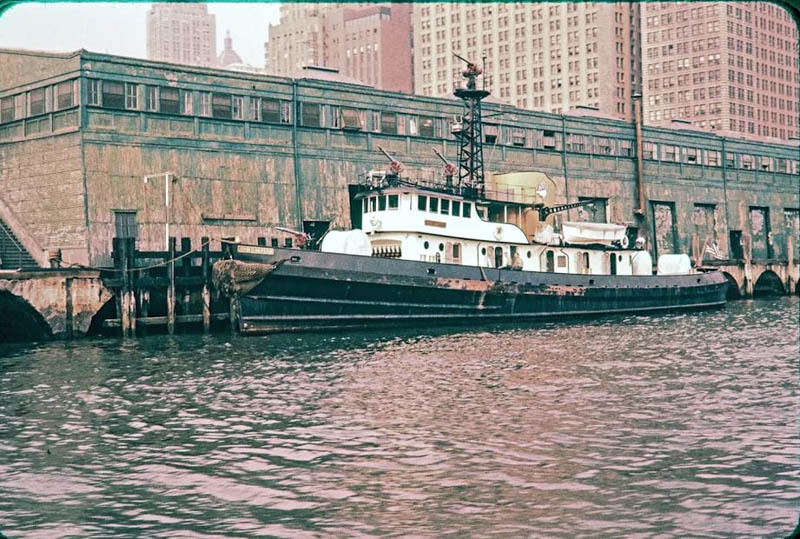 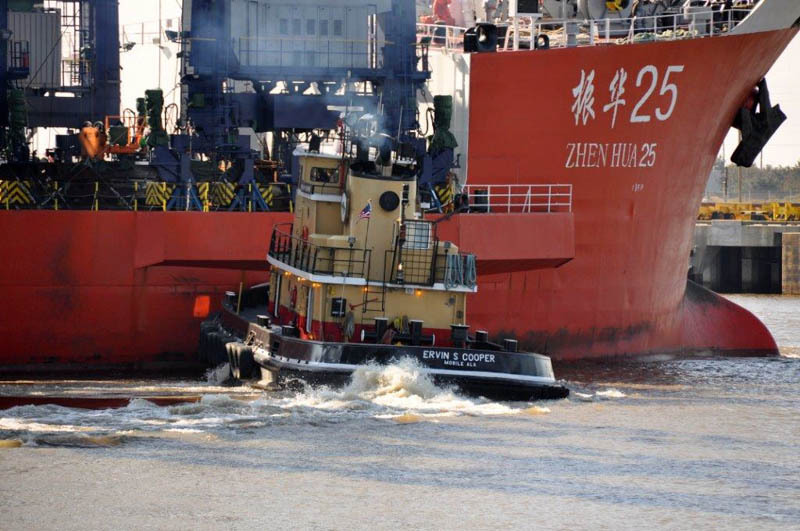 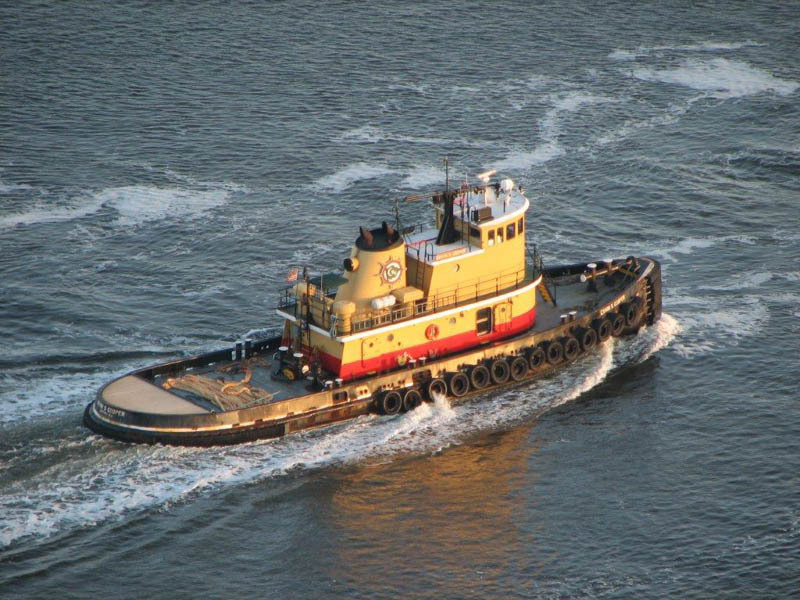 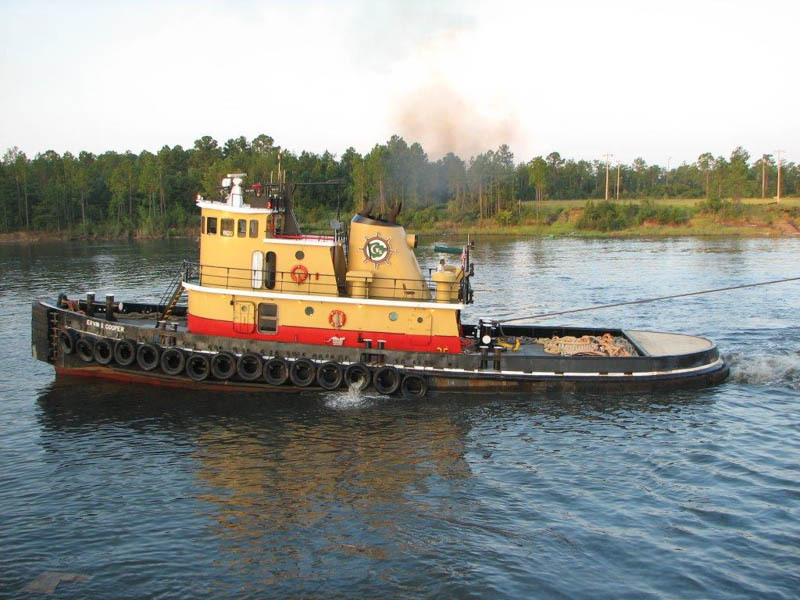 She was sold to the NYC Dept of Marine & Aviation as a shop tug. 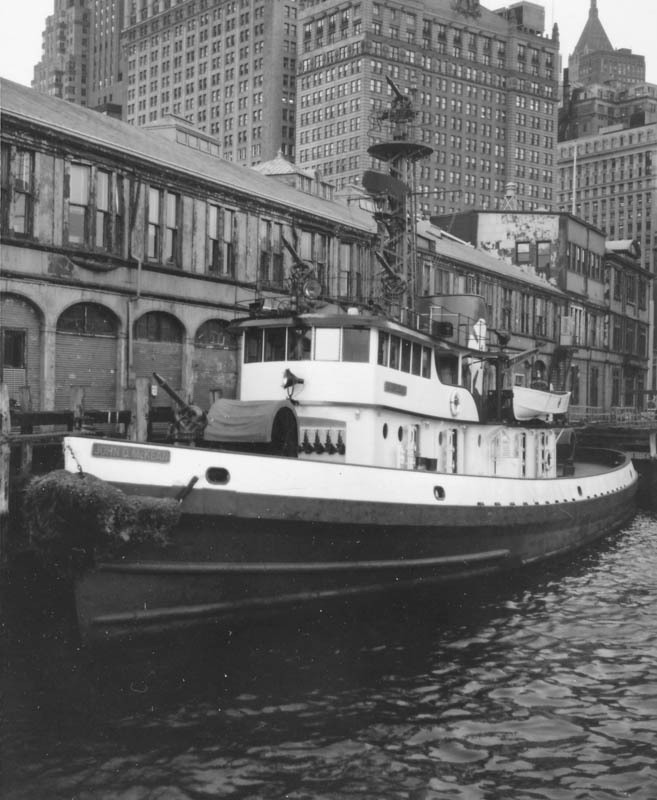 Former Fireboat "H. Sylvia A. H. G. Wilks"
Former FDNY Fireboat "H. Sylvia A. H. G. Wilks"
became a Crescent Towing Company tug "Ervin S. Cooper"